What do NBA basketball players do when they have some down time in New York City? 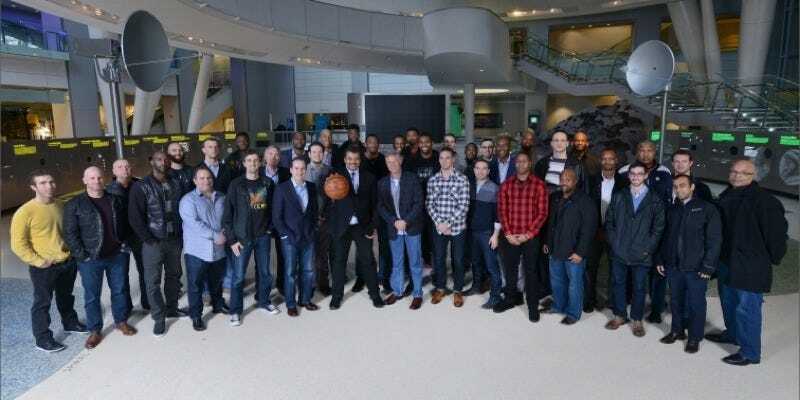 The Philadelphia 76ers dropped in on the American Museum of Natural History’s Hayden Planetarium to hobnob with director and famed astronomer Neil deGrasse Tyson. It just so happens that head coach Brett Brown is a long-time fan of Tyson’s, and reached out to the Cosmos and Star Talk host about visiting the planetarium. The team watched the standard public 25-minute presentation, and then spent an hour or so in a town hall style discussion. Power forward/center Elton Brand served as team spokesman, posing the players’ questions to Tyson.